Yes, I’m excited about talented but beleaguered Formula One star Fernando Alonso racing in the 2017 Indy 500. No, I don’t think it’s dumb. Yes, I think it’s good for both series, and after the trash run Alonso has had in his McLaren Honda F1 car, I’d love for the guy to do well. If nothing else, his IndyCar racer should look familiar. The sheets were pulled off the car Alonso will race in the Indy 500 at the end of this month, starting with testing that you can watch live this morning. 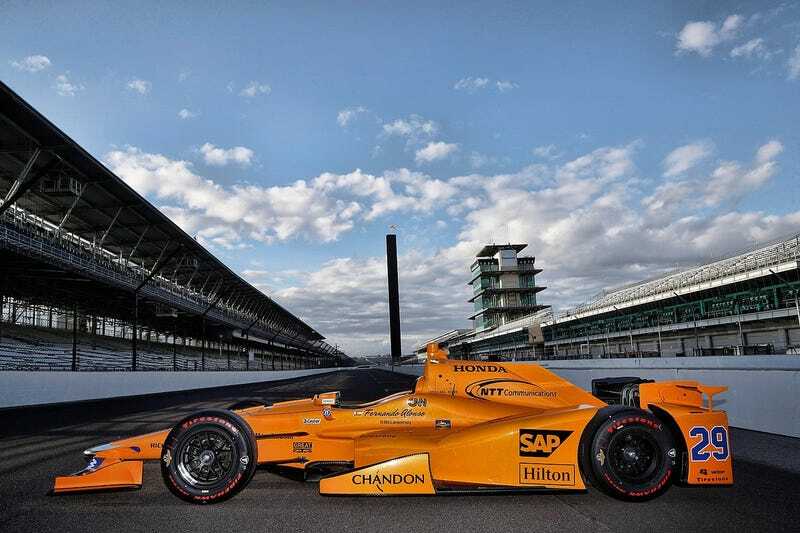 It’s the McLaren Honda-Andretti #29 car, and like the current McLaren Honda F1 cars, it embraces the brand’s historic brilliant orange coloring. As ESPN notes today, McLaren itself is no stranger to the Indy 500. It won with driver Johnny Rutherford in 1974 and 1976, both times running that orange livery. I think a win for Alonso is a hell of a longshot, but if nothing else, I’d like to see his IndyCar McLaren Honda do better than his F1 McLaren Honda. The bar for that outcome is, admittedly, quite low.